The sun is shining so hard today it’s difficult to remember that everything was white with snow less than a week ago. I took this picture last time we had snow, I no longer have a pampas grass to catch snowflakes and hold them up to be admired. The white beauty lasted longer then; this year it was only decorating the garden for two days. I’ve written haiku about snow before but it’s a subject that lends itself to the lightness of very short poems. Today has been a sunny day where I am, but cold; the forecast lately has promised snow, but it hasn’t actually arrived. My meditations on the subject of snow ended with this tangka. covering, too thin for comfort. In the towns and cities around where I live we have a lot of urban foxes. They’re not tame, but are used to humans, and I’ve often seen them trotting down the street. They move with a special grace and elegance. 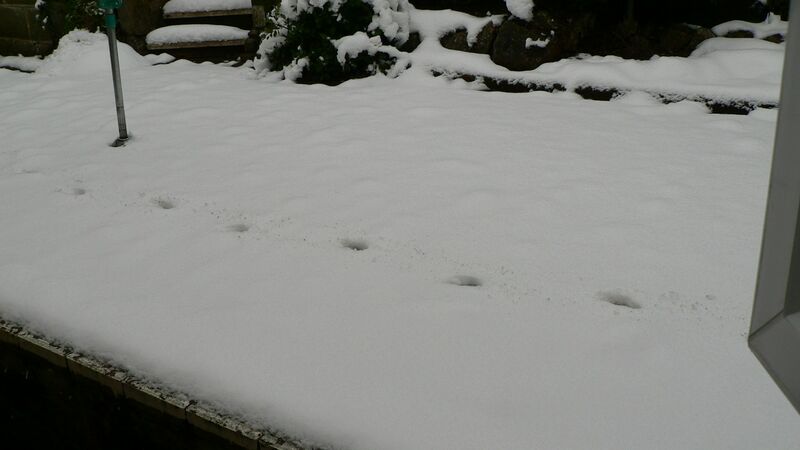 I never saw the fox that made these prints. He/she visited our street several times but always while we were asleep – it if weren’t for the snow we wouldn’t have known. The simplicity of the prints and the ephemeralness of the creature made me think of haiku. Once again there is a fascinating collection of haiku on the Carpe Diem site. Also a lot of links to some lovely poetry on the subject of ‘joyful’. I found this a difficult prompt, but one well worth trying.